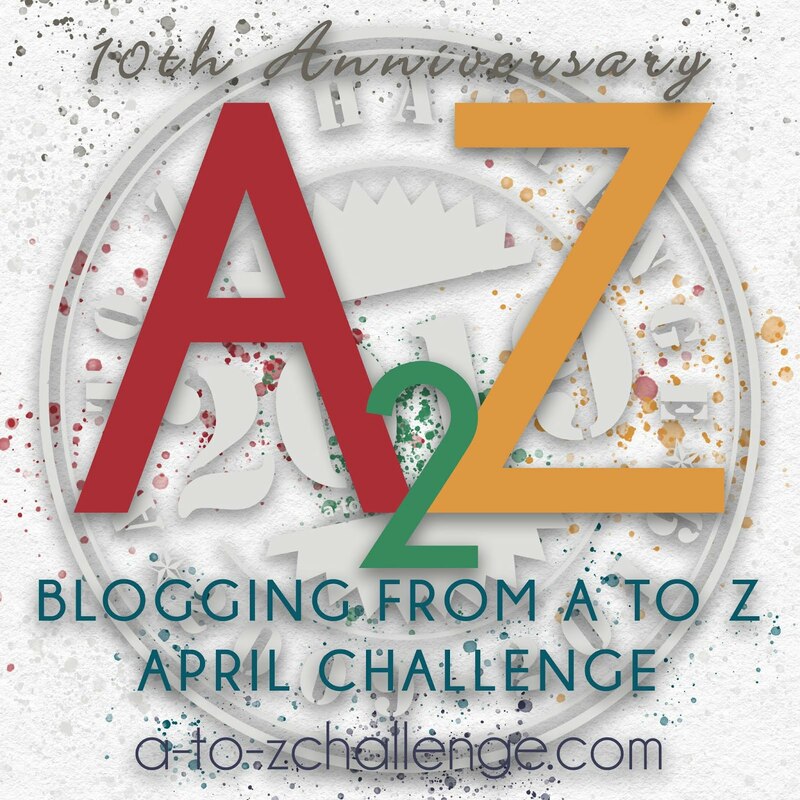 We’re celebrating our Tenth Anniversary here at the April Blogging from A to Z Challenge. #AtoZchallenge. The blog hop that made an online community by asking bloggers to spend the month of April using the English alphabet as inspiration for their posts. We’re glad you stopped by today. We’re almost to the end of another Challenge! What a great job you’ve done! What else is there to say? It’s been work, yes, but it’s also been wild, wonderful, and maybe even a bit wacky at times. Just a few days to go, but if you’ve gotten this far then you’ve got this Challenge in the bag. Giving up at this point would be just plain weird. But you’re not going to give up now. Whoopie! Time to be a winner! That’s the link to the Master List. You can find, and hop to, all the blogs officially participating on that sheet. The letter V was created when the Romans changed the look of the Etruscan upsilon, which was stolen from the Greeks, who took it from the Phoenicians (Canaanites), who adapted it from the Proto-Sinaitic Egyptian scribe shorthand. Letter v and u were once interchangeable. Ever wonder why “W” isn’t pronounced “double-V”? It’s because Germanic languages influenced heavier than Classical Latin. In Roman numerals, five is written as V.
V is the sixth least frequently used letter in the English language. Vizcacha: a burrowing rodent. Has a base score of 27 in the game of Scrabble. The word venison derives from the Latin word venor, which means hunted. It could refer to the edible meat of any hunted animal, but deer were the most popular game when the word was coming into use, thus it most often means deer meat. Villians! Who is your favorite fictional one and why? As we near the end of the month, I thought I would share with you ten Ultimate Uplifting Thoughts. Let these carry you forward. What is your favorite Uplifting quote? The A to Z Team wants to thank all participants and supporters of the Challenge. Without you A to Z would not be what it is. On a personal level I want to give a hearty thank you to our great A to Z Team who keep the Challenge running smoothly. If you’re looking for someone to thank for this year’s Challenge then don’t be heaping any praise on me. Maybe I seem to have been a bit withdrawn from the A to Z this time around and to a great extent I have. If it weren’t for the A to Z team this year this Challenge might not have gotten off the ground with the success we have seen thus far. Over the past couple of years we have downsized the A to Z Team from what it had been in the past and it’s worked pretty well in my opinion. We’ve had some outstanding A to Z Team members in the past and this year we’ve had one of the tightest most efficient teams yet. They’re all Challenge veterans who’ve gotten the routine down to a science. So my most expansive thank you to our team captain J Lenni Dorner who with great competency took the reins of this 10th annual Challenge as I’ve dealt with some distracting personal matters. J, you’re the best and hope you’ll stick with us in the coming years. Also, my thanks to Jayden R Vincente who has done a fantastic job setting up the sign-up lists and maintaining them. Another big thank you goes to John Holton who has provided technical assistance to make things run better as well as his continual efforts to promote A to Z. And finally there is Zalka Csenge Virág who has been a key A to Z Team member since 2015 and provided valuable promotional support for the Challenge. I hope everyone who reads this post will take the time to visit the blogs of each of these members to say thank you. I’m sure they’d appreciate that. #AtoZchallenge: The blog hop that made an online community by asking bloggers to spend the month of April using the English alphabet as inspiration for their posts. We’re glad you stopped by today. Do you get a little depressed knowing that the end of the A to Z Challenge is just over a week away? I mean, you’ve been through a month of pretty intensive blogging. If you’re not accustomed to posting every day, this can seem like a lot. Even if you are accustomed to posting every day, this can seem like a lot. On the other hand, some of you who aren’t accustomed to posting every day might be considering it, or at least posting more frequently than you have. Whatever the case, the one thing you don’t want to do is stop. You’ve spent a month building up traffic on your blog. This is no time to just say “See you next year!” You want your readers to keep coming back, don’t you? The key to keeping your readers coming back is consistency. You might only post on Wednesday (or every other Wednesday), but that’s enough if you let your readers know that you’ll have something new for them every (other) Wednesday. So, decide what your posting schedule will be from May 1, 2019 until March 31, 2020. And remember, schedules can be changed if you discover that another day(s) works better, or if you feel you can add more days or have to cut back. You’ve got good momentum going into the stretch. I hope we keep seeing you the rest of the year! Ready, Set, Go…. into the home stretch of A to Z! We are getting into the home stretch! We have one more weekend in April. So get ready to jump into the last 8 days! And hopefully, life will be slowing down for me after April. I thought I would share with you some things I am ready to do once the last days of A to Z wind down! 1) Reflect on my adventure of A to Z while I write my Reflections post on May 6th. 2) Read the blogs I missed. 3) Read comments on the blogs I fell in love with. 5) Rave about awesome blogs I read. 6) Road Trip with A to Z Blogs starting May 20th. 7) Respond to the A to Z Survey between May 3rd and May 18th. 8) Rejuvenate myself to get ready for more writing! 9) Review the novels I’ve read but didn’t review yet. What are you most looking forward to next? Even if questions seem self-explanatory, they can spark responses if they are written down, rather than implied. Be creative, and have fun!